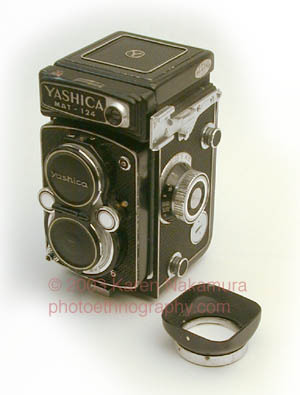 The Yashicamat 124 is a twin-lens reflex (TLR) camera that is basically a copy of the Rolleiflex. 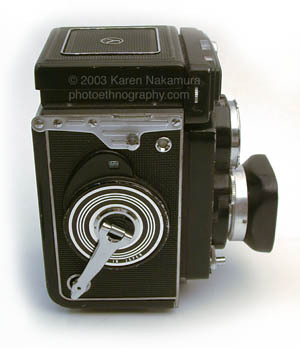 It uses 120 size film (medium format) to shoot 6 x 6 square format photos (same as a Hasselblad). Using the text or images on this website without permission on an ebay auction or any other site is a violation of federal law. I purchased this camera a couple of years ago to see if medium format was my thing. It was, the Yashica had excellent resolution and the tonality of medium format positives just blew me away. Unfortunately, I was so entranced by the Yashicamat, I later on bought a Mamiya RB67 system and never used the Yashicamat after that. The RB67 is for the studio, while I have a Koni-Omega Rapid M for outdoor medium format photography. It's just a bit difficult to frame when things are reversed in the TLR finder. I like the look of the 124 and the little Yashica 44LM, but I doubt I'll ever use them. * OK, so the 124G had a nicer finish on the outside, BUT it also used wimpier (i.e., cheaper) gears. The 124 has sturdier internal mechanisms. The Yashicamat 124 takes simply astoundingly sharp pictures. Here are some samples shot on Fuji Velvia (an E-6 slide film) and scanned with the Epson Perfection 2400, a standard flatbed scanner with a transparency adaptor that costs around $300. The resulting files are 5400 x 5400 pixels large, or 90 megabytes in size at 24 bit depth (at the scanner's full 48 bit depth, the files are 180 megabytes large). That's the equivalent of a 30 megapixel digital camera! You can print the scans at 240 dpi at a whopping 22" x 22" without interpolating. Try that on your $2000 digital camera! A reduced version of each photo is shown along with a 8x zoom up. To put the zoomed in version in perspective, to view the zoomed version at 100%, the original file would have to be printed at almost 100" x 100" or an 8' x 8' mural. The actual slide shot is even sharper than the scan as the Epson 2450 is really a 1200 dpi scanner, not a 2400 dpi one.The slides themselves are extremely crisp. You can count the number of leaves on the trees in the autumnal photo (sample #2). If you want the original sample files (about 3 megabytes compressed at JPEG 8; about 20 megabytes compressed at JPEG 12), please let me know and I will arrange to make them available. With a high power loupe, you can easily make out the fine details. My scanner is really at its limits here. The slight unsharpness here is caused by the scanner. With a loupe, you can make out the features of this person and easily identify him. Remember that this is the detail from an image blown up to about 8' x 8'! I came across your web article on the Yashica Mat 124 G recently. Your detail & insight on this vintage camera convinced me it represented an excellent entry-level for me into the world of medium-format film cameras. Perceiving that you too appreciate precision & accuracy, I would humbly point out a typo you would no doubt wish to address - on the following link (in the specs table at the end), you've listed the focal length of the Yashica Mat 124G as 80cm... when I believe it is 80mm.